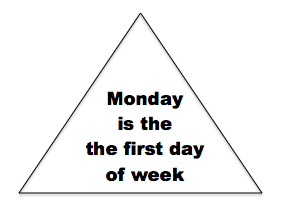 Did you say “Monday is the first day of the week?” Almost everyone does! Now go back and read it again, carefully. What’s the deal? The Mosaic Project is an Oakland based nonprofit that works “toward a peaceful future by reaching children in their formative years.” This quick example illustrates how our minds perceive what we think we are going to see, rather than what we are actually presented with. By confronting these issues in a safe, inclusive, comfortable environment, youth have the opportunity to learn skills to work toward peace. Watch the video below to see Gyasi, Youth Leadership Director at The Mosaic Project, deliver the above experiment to The Athenian School. To learn more about The Mosaic Project and how you can get involved, go here.